In the second pAsuram, AzhwAr highlights SrI rAma’s greater quality in comparison with what was explained in the previous pAsuram. While in the previous pAsuram, AzhwAr explained how SrI rAma captivated everyone in ayOdhyA with his qualities, in this pAsuram, AzhwAr explains how SrI rama did not leave anyone behind while ascending to paramapadham and how he took them there along with him. Subsequently, AzhwAr explains how emperumAn protected by remaining in ayOdhyA for eleven thousand years instead of ascending to paramapdham immediately after accomplishing the task cut out for the particular avathAram. Second pAsuram. Some explain the greatness of the qualities explained in the subsequent pAsurams as “Desiring to speak about the qualities [of emperumAn] which are explained in the subsequent pAsurams, AzhwAr says that the quality explained in the previous pAsuram is not so great”. AvarO – will they become servitor of anyone else? After having heard through SrI rAmAyaNam about emperumAn taking birth in the place where his greatness is not understood, going through sufferings which even they do not undergo, for those ungrateful men who blame him subsequently, seeking the rAkshasas who torment them where they live, in their own places and killing them, protecting the place and uplifting them to spare them from rebirth and the way he presented himself, will those who are born, become the servitor of anyone else other than chakravarthi thirumagan, who has unconditional relationship? nAttil piRandhavar – Everyone takes birth in some place. Here, the emphasis is on having taken birth in the abode where SrI rAma’s qualities are observed. [Should he say where perumAL’s qualities are observed?] But there is no place outside the boundary of perumAL’s kingdom. SrI rAmAyaNam kishkindhA kANdam 18.6 “ikshvAkUNAm iyam bhUmis saSaila vana kAnanA” (This earth with mountains, forests are under the reign of ikshvAku dynasty). sIthAp pirAtti too said to rAvaNa in SrI rAmAyaNam sundhara kANdam 21.20 “vidhithassa hi dharmagya:” (Have you not heard of perumAL’s qualities?) If only there is a place where his qualities are not observed, that place will be outside his reign. Being born in the kingdom means being born within the boundary of his kingdom and taking shelter under his shoulder. naraNaRku – The name “nArAyaNa” implies the following qualities in perumAL – mingling with everyone without any restriction, placing himself for the sake of his followers, accepting arrows on his chest for their sake, eliminating their enemies, being like a mother for the followers, not leaving them on seeing their defects. Due to these qualities, it is apt to call perumAL as “nArAyaNa” [here the term perumAL refers to SrI rAma]. AL anRi AvarO – In the previous pAsuram, it was said “kaRparO” (will they learn? ), and in this pAsuram it is said “AL anRi AvarO” (will they not become servitor?) – this implies that the result of learning, is to become a servitor. sa: jagyE hi – One who is well known from the authentic scriptures that he has no birth due to karma, has taken birth which is beyond the imagination of even those bound by karma. What is the reason for his birth? arthitha: – due to the prayer of the dhEvas; their prayers caused his desire since it is said that he took birth out of his own desire in SrIvishNu purANam 6.5.84 “ichchA gruhItha” (he incarnated out of his desire). dhEvai: – He took birth for those who begged him for fulfilling their task and one the task was completed, would say “ISvarOham” (I am the lord)! They prayed as in thiruviruththam “nIL nagar nIL eri vaiththaruLAy” (mercifully burn down this great lankA). udhIrNasya rAvaNasya – The lowly rAvaNa who caused fear in them; emperumAn himself had to descend and kill rAvaNa who became very powerful due to the boons he acquired. vadhArthibhi: – due to the sufferings they went through, they requested him to do what is not acceptable to his divine heart. He only killed him thinking “if we killed this one person, the whole place will survive”. arthitha: – He felt their prayer until he returned to his divine abode of paramapadham. arthitha: – they did not perform any upAsana, but just prayed. mAnushE lOkE – The dhEvas who were created [by bhagavAn], would hate the smell of humans, vomit on looking at them and with great dislike to step on earth, remain one and half yOjanA (about 15 miles) from the ground and accept the offerings given to them in yagyas (rituals); emperumAn in front of whom those dhEvas look like manushyas in front of them, himself descended here. It is said in thiruvAimozhi 8.1.5 “manisarkkuth thEvar pOla dhEvarkkum dhEvAvO” (just as dhEvas are for manushyas, you are dhEva for the dhEvas). jagyE – It was not mere AvirbhUtham (manifesting directly); if the worldly people go through ten months in the womb, he spent twelve months in the womb; it is said in Sri rAmAyaNam bAla kANdam 18.10 “thathaScha dhvAdhaSE mAsE” (subsequently, on the twelfth month of chaithra, SrI rAma took birth) and SrIvishNu purANam 5.3.14 “jathOham yaththavOdharAth” (I was born from your womb). vishNus sanAthana: – the eternal lord, vishNu. nAttai aLiththu – “nAttil piRandhu … manisarkkA” – [A summary up to this point] emperumAn, who is not bound by karma, took birth in this world along with the souls who are bound, went through sufferings which are even beyond their sufferings such as being separated from the daughter of janakarAja, with his soul on the other side of the ocean [along with sIthA] and his mere body remained here, lost jatAyu, etc. Further, for the sake of the ungrateful people, going to the places of demoniac enemies such as rAvaNa et al who harm the harmless people, as said in perumAL thirumozhi 9.5 “porundhAr kai vEl nudhi pOl paraRpAya melladigaL kurudhi sOra – virumbAdha kAn virumbi” (desiring the undesirable forest where the sharp stones would tear his tender feet to let the blood flow out from there) and perumAL thirumozhi 9.2 “evvARu nadandhanai em irAmAvO” (Oh my dear rAma! how did you walk in the forest?). Subsequently, when he mercifully stood victorious at the entrance of lankA, all the dhEvas starting with brahmA arrived there and said as in SrI rAmAyaNam yudhdha kANdam 117.29 “thadhidham na: krutham kAryam – prahrushtO dhivamAkrama:” (purpose of your birth is accomplished – return to your divine abode with joy) – indicating “Your highness have fulfilled our prayers without seeing our lowliness; now, you can return to your splendorous abode”; at that time rudhra said “the whole of SrI ayOdhyA is greatly suffering in separation from you; you should return to SrI ayOdhyA and spend some loving time with your divine mothers, divine brothers and the residents of the sacred abode and protect them”; “nAttai aLiththu” implies emperumAn‘s loving reign of his kingdom stretching for eleven thousand years as said in thiruvAimozhi 4.8.5 “kadal gyAlaththu aLi mikkAn” (with great compassion towards the world surrounded by ocean). Due to this reason,vAlmikI maharishi called the three-eyed rudhra as in SrI rAmAyaNam yudhdha kANdam 117.3 “shadardha nayanaSrImAn” (the three-eyed SrImAn (wealthy person)) [here the wealth in him was to desire for emperumAn’s presence in this world, beyond the selfish interest of dhEvas]; otherwise, there is no reason to call a bhikshuka (mendicant) as SrImAn. uyyach cheydhu – this is talking about how emperumAn cared for them [the residents of SrI ayOdhyA] for a long time being together to make them unsustainable in his absence and took them along [to paramapadham] instead of leaving them behind, and uplifted everyone. nadandhamai kEttumE – AzhwAr is talking about perumAL taking everyone along with him as said in SrI rAmAyaNam uththara kANdam 109.22 “thiryak yOni gathASchApi sarvE rAmamanuvrathA:” (all the animals followed SrI rAma), “vivESa vaishNavam thEjas saSarIrassahAnuka:” (emperumAn ascended to paramapadham with a spiritual form along with the residents of SrI ayOdhyA). kulaSEkarAzhwAr has mercifully eliminated all doubts about the place where they reached; taking them along to paramapadham as said in perumAL thirumozhi 10.10 “anRu sarAsarangaLai vaigundhaththERRi” (lifting all the mobile and stationary entities to SrIvaikuNtam on that day [when he ascended there]). nadandhamai kEttumE – Even after hearing this travelogue. That is taking along those who are hungry [for bhagavath vishayam] and helpless [in attaining him]. The companion for the pilgrimage is “puNdarIkAksha nAma sankIrthanAmrutham” (the nectarean names of lotus eyed lord). Travelling along saying as in jithanthE sthOthram 1″jithanthE puNdarIkAksha” (lotus eyed lord has won us over). It is said in SrI rAmAyaNam sundhara kANdam 35.8 “rAma: kamalapathrAksha:” (SrI rAma who has eyes like lotus petals). 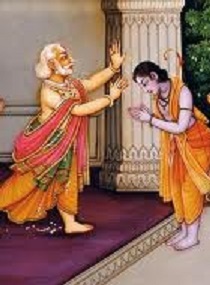 Would one not become the servitor of nArAyaNa even after hearing how he uplifted everyone as SrI rAma? In the previous pAsuram, AzhwAr said that emperumAn descended and captivated the samsAris (materialistic people) who were engaged in worldly pleasures and who would hear about sarvESvara from anyone [without proper analysis of the principle/source], with his beauty and qualities and transformed them to be fully dependent on him; in this pAsuram – was that great? After transforming someone to be totally dependent on him and leaving them behind, is as good as being a cruel murderer; instead of doing that, the quality of taking them along with him and protecting them is such a great quality – says AzhwAr. This entry was posted in thiruvAimozhi, thiruvAimozhi 7th centum on September 5, 2018 by Sarathy Thothathri.